Prosci's Communication Checklist draws from over 20 years of benchmarking research, giving you access to the best practices when communicating about change to your organization. Use the checklist as an audit for your current change management activities, or use it as a guide as you plan for new initiatives and projects. 1. Using the preferred senders to deliver communications in your organization? When individuals learn of a change, their first question is, "Why is this happening.” Senior leaders tend to focus on the vision of the future state, and project teams tend to focus on sharing their great new idea. However, the first communications about a change should focus on why the change is happening. And don't forget to continue and reinforce the 'why' throughout the entire project, especially if time elapses between your first communication and the start of implementation. Making a change is a personal choice, no matter what senior leaders believe. Communications about change must resonate. To be effective, communications must get at what an employee cares about and values. To gain their support, you must provide a compelling case for how they will be better off or what they get out of engaging in the change. Answer WIIFM (what's in it for me?) early and often in your communications. 4. Resisting the urge to communicate through the project team? Employees prefer to hear messages from two people in the organization, and neither is the project leader. One of the biggest and most common mistakes you can make is to have a project team sending all of the communications. Face-to-face communication was identified as the most effective form of communication. While it is more time intensive, do not underestimate the value that face-to-face communication creates. 6. Repeating key messages five to seven times? It is important to repeat key messages a number of times. The first time you announce a change to employees, they are often wondering how it will impact them and not focusing on the details of what you are communicating about. Repeating key messages ensures that what you want to get across is heard by employees. Share messages more often than you think you need to. 7. Creating opportunities for two-way communication? You need to craft and plan for two-way communication. Give employees the opportunity to share their concerns, provide their feedback and ask questions. Two-way communications create buy-in and provide answers in real-time. 8. Preparing the communicators to deliver effective communications and have the necessary conversations? One of your key roles will be to prepare the preferred senders (such as managers and supervisors) of change messages. This includes sharing with them the important messages that need to be delivered, creating alignment between different senders, and planning the delivery sequence. It also includes educating them on how to deliver key messages. 9. Finding effective ways to reach your audience? A holistic communication plan uses numerous channels to reach employees. This could include meetings, one-on-one conversations, newsletters, presentations, brainstorming workshops, lunch and learns, Intranet Q&A forums, CDs, screen saver messages, etc. Be creative in how you communicate and gather feedback from employees. 10. Using assessment tools to evaluate the effectiveness of communication messages? Communications cannot be viewed as an activity that is planned, delivered and then checked off the list of work to be done. You must find ways to ensure that employees are hearing and interpreting the messages you are trying to send. Assessment tools will help you identify when you haven't communicated effectively, or when the message is being misinterpreted, so you can continue to correct and refine your communications. 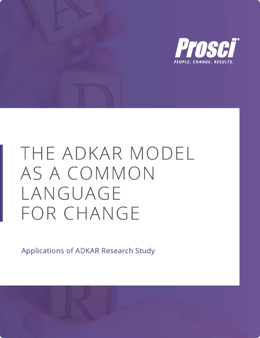 In a research effort to understand how organizations use The Prosci ADKAR Model, Prosci asked questions about using ADKAR as a common language for change.